New Delhi - March 22, 2019: YuppTV, the world’s leading OTT platform for South-Asian content, has acquired the digital broadcasting rights for Vivo IPL 2019 outside of India. With this development, cricket fans across the globe can catch all the action of Season 12 of the world’s biggest T20 tournament, right as it unfolds. YuppTV is bringing the highly engaging action to all of its existing and new users in Australia, Continental Europe, Singapore, Malaysia, Sri Lanka and RoW including South & Central America and Central & South East Asia. Cricket fans in Australia, Continental Europe, Singapore, Malaysia, Sri Lanka and RoW including South & Central America and Central & South East Asia can catch all the action from IPL 2019 on YuppTV. 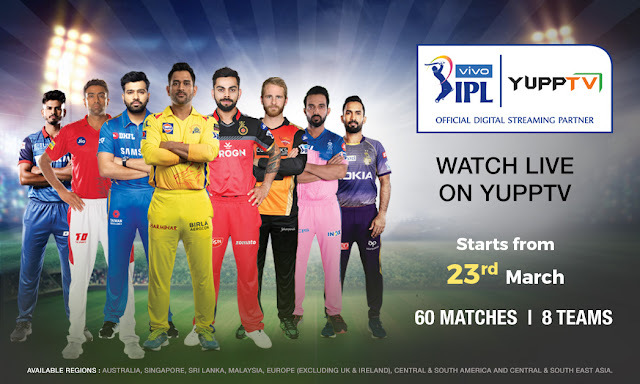 The may log on to https://www.yupptv.com/cricket/ipl-2019/live-streaming or access the same via the YuppTV app on smart TVs, smart Blu-ray players, streaming media players, gaming consoles, smartphones, and tablets. YuppTV is one of the world’s largest internet-based TV and On-demand service provider for South Asian content, offering more than 200 TV channels and 2000+ movies in India. YuppTV, recently received funding from Emerald Media, a Pan-Asian platform established by leading global investment firm KKR for investing in the media and entertainment sector, wherein Emerald Media acquired a significant minority stake in the company for US$50mn. YuppTV had earlier raised its Series Around of funding from Poarch Creek Indian Tribe of Alabama. YuppTV is currently ranked #1 Internet Pay TV platform for Indians living abroad and the largest Internet TV platform from premium content availability in India. YuppTV is the most downloaded Indian SmartTV app and it also boasts of 13 million mobile downloads with 4.0 user rating. Visit https://www.yupptv.com for more information.